DESCRIPTION: 2 story apartment over a garage that is used only for storage by the owners <no tenant access except for garbage disposal>. The Carriage House sits behind the main house Cove House <Sleeps 10 and also available for rent> and also shares the property with another cottage Cove Cottage <sleeps 4 and also available for rent>. All 3 properties are situated on a shared wooded 2 +/- acre lot with beautiful ocean views. 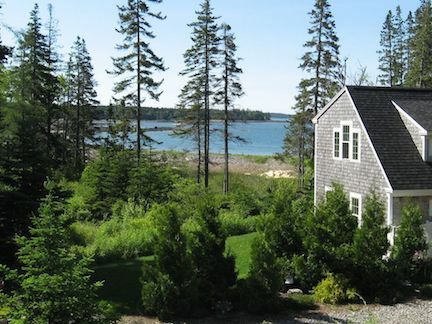 The Carriage House will sleep 6 and is the perfect spot for your Maine vacation. It offers an open floor plan for ease of living and is comfortably outfitted and decorated. 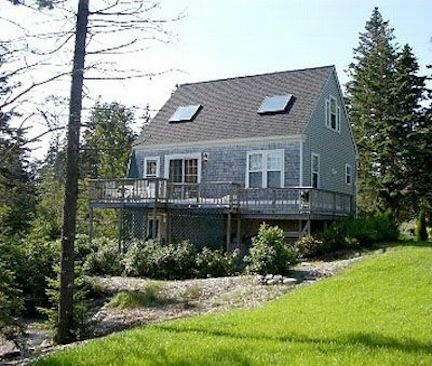 Enjoy the ocean views from the deck as well as many / most rooms in the property. Wildlife is abundant and often sited on the property <deer, foxes, eagles, giant heron to name a few>. There is shared / private access to the beach and 35 +/- acres of Nature Conservancy for your exploring pleasure. LAYOUT: FIRST LEVEL: Open floor plan with the living and dining room and a galley style kitchen. Full bath with laundry. Bedroom with a queen bed. Deck with water views. SECOND LEVEL: Loft sitting area with pull out double sofa bed. Master bedroom with a queen size bed and en suite bathroom that boasts a Jacuzzi tub / shower combo. Small deck with views. **PLEASE NOTE: The staircase to the second level is steeper then normal and may not be suitable for people who have difficulties climbing stairs. for additional guest up to 6. Owners live in detached cottage on property.